Make One or Both in Colors to Fit Your Decor! 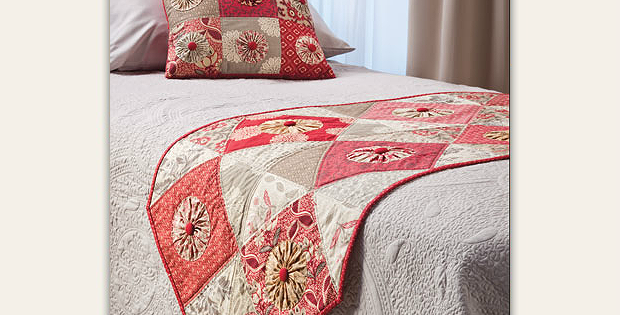 Choose a pretty combination of 10″ layer cake squares for this beautiful bed runner. The matching pillow creates a lovely set that will dress up any bed. Select colors you like best for your unique interpretation of the runner, pillow or both. Many fabric styles will work nicely to create the right mood for your room. Simple piecing makes these a breeze to put together. Yo-yos and buttons are lovely finishing touches. Stitch the yo-yos down by hand or machine. 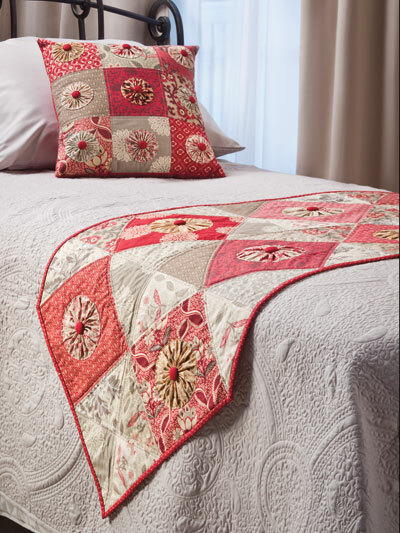 You’ll find the patterns for the “Pop of Color Bed Runner and Pillow” in Sweet Layer Cakes. Click here to purchase Sweet Layer Cakes.